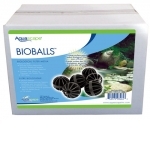 Aquascape Bio Balls Provides over 30 sq. inches of surface area per Bio Ball for beneficial bacteria to attach. String together on enclosed cord to create an easy to clean bio-rope!